Clothes, cars, trains, tractors, body sensors, and tracking tags. By the end of this decade, analysts say, 50 billion things such as these will connect to mobile networks. They’ll consume 1000 times as much data as today’s mobile gadgets, at rates 10 to 100 times as fast as existing networks can support. So as carriers rush to roll out 4G equipment, engineers are already beginning to define a fifth generation of wireless standards. What will these “5G” technologies look like? It’s too early to know for sure, but engineers at Samsung and at New York University say they’re onto a promising solution. The South Korea–based electronics giant generated some buzz when it announced a new 5G beam-forming antenna that could send and receive mobile data faster than 1 gigabit per second over distances as great as 2 kilometers. Although the 5G label is premature, the technology could help pave the road to more-advanced mobile applications and faster data transfers. Samsung’s technology is appealing because it’s designed to operate at or near “millimeter-wave” frequencies (3 to 300 gigahertz). Cellular networks have always occupied bands lower on the spectrum, where carrier waves tens of centimeters long (hundreds of megahertz) pass easily around obstacles and through the air. But this coveted spectrum is heavily used, making it difficult for operators to acquire more of it. Meanwhile, 4G networks have just about reached the theoretical limit on how many bits they can squeeze into a given amount of spectrum. So some engineers have begun looking toward higher frequencies, where radio use is lighter. Engineers at Samsung estimate that government regulators could free as much as 100 GHz of millimeter-wave spectrum for mobile communications—about 200 times what mobile networks use today. This glut of spectrum would allow for larger bandwidth channels and greater data speeds. Wireless products that use millimeter waves already exist for fixed, line-of-sight transmissions. And a new indoor wireless standard known as WiGig will soon allow multigigabit data transfers between devices in the same room. But there are reasons engineers have long avoided millimeter waves for broader mobile coverage. 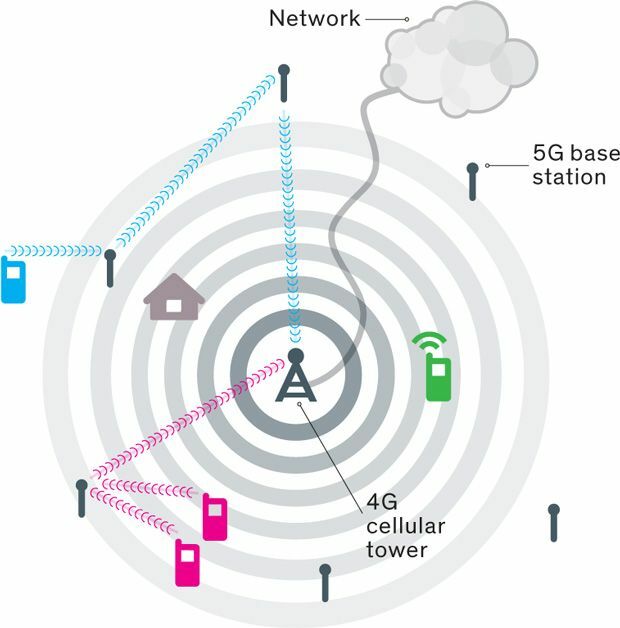 5g Beam Scheme: Steerable millimeter-wave beams could enable multigigabit mobile connections. Phones at the edge of a 4G cell [blue] could use the beams to route signals around obstacles. Because the beams wouldn’t overlap, phones could use the same frequencies [pink] without interference. Phones near the 4G tower could connect directly to it [green]. For one thing, these waves don’t penetrate solid materials very well. They also tend to lose more energy than do lower frequencies over long distances, because they are readily absorbed or scattered by gases, rain, and foliage. And because a single millimeter-wave antenna has a small aperture, it needs more power to send and receive data than is practical for cellular systems. Samsung’s engineers say their technology can overcome these challenges by using an array of multiple antennas to concentrate radio energy in a narrow, directional beam, thereby increasing gain without upping transmission power. Such beam-forming arrays, long used for radar and space communications, are now being used in more diverse ways. The Intellectual Ventures spin-off Kymeta, for instance, is developing metamaterials-based arrays in an effort to bring high-speed satellite broadband to remote or mobile locations such as airplanes. Samsung’s current prototype is a matchbook-size array of 64 antenna elements connected to custom-built signal-processing components. By dynamically varying the signal phase at each antenna, this transceiver generates a beam just 10 degrees wide that it can switch rapidly in any direction, as if it were a hyperactive searchlight. To connect with one another, a base station and mobile radio would continually sweep their beams to search for the strongest connection, getting around obstructions by taking advantage of reflections. In outdoor experiments near Samsung’s Advanced Communications Lab, in Suwon, South Korea, a prototype transmitter was able to send data at more than 1 Gb/s to two receivers moving up to 8 kilometers per hour—about the speed of a fast jog. Using transmission power “no higher than currently used in 4G base stations,” the devices were able to connect up to 2 km away when in sight of one another, says Wonil Roh, who heads the Suwon lab. For non-line-of-sight connections, the range shrank to about 200 to 300 meters. Theodore Rappaport, a wireless expert at the Polytechnic Institute of NYU, has achieved similar results for crowded urban spaces in New York City and Austin, Texas. His NYU Wireless lab, which has received funding from Samsung, is working to characterize the physical properties of millimeterwave channels. In recent experiments, he and his students simulated beam-forming arrays using megaphone-like “horn” antennas to steer signals. After measuring path losses between two horn transceivers placed in various configurations, they concluded that a base station operating at 28 or 38 GHz could provide consistent signal coverage up to about 200 meters. Millimeter-wave transceivers may not make useful replacements for current cellular base stations, which cover up to about a kilometer. But in the future, many base stations will likely be much smaller than today’s, Rappaport points out. Already carriers are deploying compact base stations, known as small cells, in congested urban areas to expand data capacity. Not only could millimeter-wave technology add to that capacity, he says, it could also provide a simple, inexpensive alternative to backhaul cables, which link mobile base stations to operators’ core networks. Other wireless experts remain skeptical that millimeter waves can be widely used for mobile broadband. “This is still theoretical; it has to be proven,” says Afif Osseiran, a master researcher at Ericsson and project coordinator for theMobile and wireless communication Enablers for the Twenty-twenty Information Society (METIS). The newly formed consortium of European companies and universities is working to identify the most promising 5G solutions by early 2015. Osseiran says METIS is considering a variety of technologies, including new data coding and modulation techniques, better interference management, densely layered small cells, multihop networks, and advanced receiver designs. He emphasizes that a key characteristic of 5G networks will be the use of many diverse systems that must work together. “Millimeter-wave technology is only one part of a bigger pie,” he says.